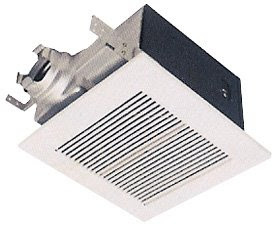 * Expandable extension bracket up to 24"
This WhisperCeiling™ ventilation fan features a centrifugal blower which ranges from 50 CFM to 380 CFM. The Panasonic blower wheel is designed to draw air in from both sides, which helps keep the noise down, as there is more area for the air to enter the wheel. This bathroom exhaust fan is quiet enough that you might not even know it's on. This fan is designed to give you continuous, trouble-free operation for many years thanks to its high-quality components and permanently lubricated motors. The fan housing is made of heavy-gauge zinc galvanized steel and painted to protect it from rust. Energy Star qualified products feature super-quiet operation and high CFM-to-Watt efficiency. This Panasonic fan has a built-in damper to prevent backdraft. Cool running motors and fluorescent bulbs do not create excessive heat.